Hi There! 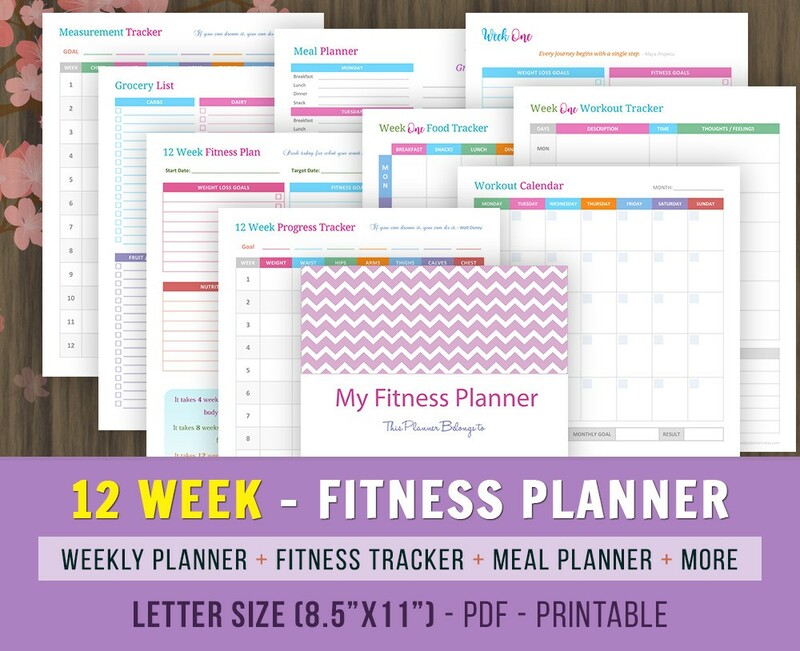 If one of your goals is to lose weight, eat healthy and stay fit in the new year, you need this 12 Week Fitness Planner in your life. What’s in the Fitness Planner? This Fitness Planner was designed by keeping in mind the requirements for some one who not only wants to lose weight, but also stay fit and healthy. If your goal is not to lose any weight, but just eat right and stay fit, this planner should work perfectly as well. Keep track of what you eat for breakfast, lunch, dinner and snacks. You can also keep track of your calorie intake. You can keep track of your water intake. There are total of 8 glasses in the graphics that you can check mark as soon as you drink your glass of water. This is especially helpful if you are not drinking enough water throughout the day. Winters are the worst for us all. There are days we can all go without a glass of water all day long, but go crazy for coffee or tea. This 12 Week Food Tracker is very helpful for those winter days. Write down your weight loss and fitness goals in this sheet. When you reach your set goals, you can put the check mark across that goal. To make it more appealing, you can add the before and after photo space at the bottom of this sheet. What more fun way to lose weight and stay fit then comparing yourself from when you first started. It feels like such an accomplishment. With this Weekly Food Tracker, you can easily track what you ate on a particular day. If you ate healthy or not, how many calories, how much snacking and how many glasses of water. This weekly meal planner lets you plan your meal menu for the week. Once you decide what you will be cooking in the kitchen for the next 6 – 7 days, you can prepare your grocery list. Buy stuff that is actually required in the kitchen. This helps you from buying any unhealthy or junk food. You will also end up not buying things you won’t need immediately. Weight Loss Tracker, Fitness Tracker and Measurement Tracker helps set reasonable goals for weight loss, track fitness activity and track body measurements. Do you have any fitness goals that you would like to achieve this year? Please do share!